They had a church wedding last Monday! Maxene Magalona and Rob Mananquil's wedding on January 11, 2018 at Shangri-la's Boracay Resort and Spa is apparently their second wedding! The first one happened last Monday, January 8, at 10:00 a.m. at Santuario de San Antonio Parish in Forbes Park, Makati City. The news of their first wedding was first revealed to the public by Maxene's younger sister, Saab Magalona, on January 12. On her Instagram account, Saab posted two combined photos, one on top of the other, of her and Maxene. She wrote the caption, "Top photo was taken on my wedding day [in] 2015 and the bottom one was last Monday when Maxx and Robby had a small church ceremony just for family. I'm so happy we were able to recreate this photo. I love you, Maxx!!! Spent all day just stalking your Boracay wedding! We didn't even realize that we wore our hair the exact same way two years ago!!! Love you so much!" Saab couldn't make it to the Boracay wedding because she wasn't allowed to travel until after she gives birth to her twins. Hours later, Robby's sister, Rissa Mananquil Trillo, posted on her Instagram account more details of the church wedding. She described it as "so private, there weren't even any coordinators. The couple just spoke over the mic to gather everyone and start the solemn ceremony." On another Instagram post, Rissa added that during the first wedding, "Only the immediate families and principal sponsors were present. Attire was black suits for the men and blush pink for the women. 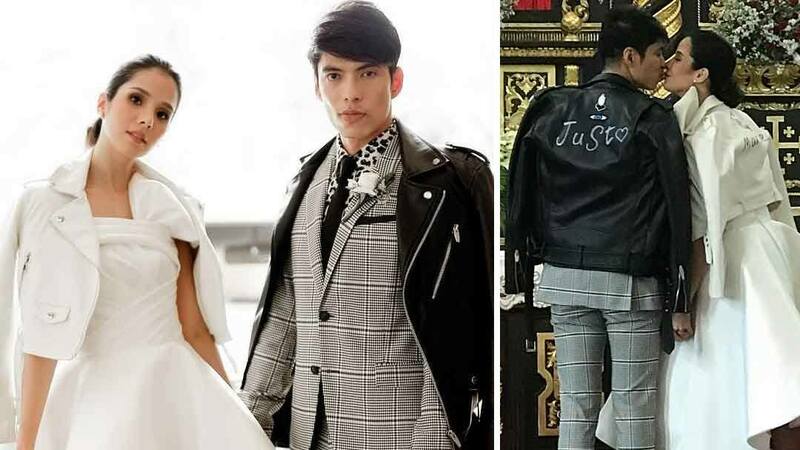 The couple left the ceremony with matching black and white leather jackets [bearing] the words 'Just Married.'" On her next post, Rissa revealed the ninongs and ninangs: "Ben Chan with [a] dear family friend Miguel Pastor, Richard and Lucy Gomez, Keren Pascual, Dr. Z and Aivee Teo, Michael V. (who was Francis Magalona's best friend), and Gary Valenciano, who also joined the Boracay wedding and revealed to the guests that the couple exchanged vows earlier [that] Monday." And here's Maxene's wedding look before she said 'I do' for the very first time. Yup, it's gorgeous and perfect!